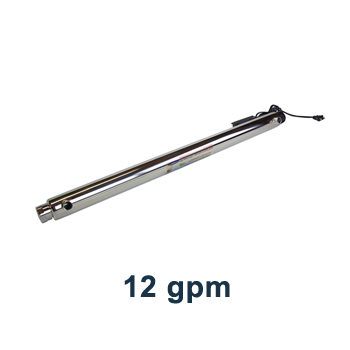 Ultraviolet Water Sterilizer System 6-12 GPM , designed to remove microorganisms that can range from bacteria and viruses to algae and protozoa. It's advanced UV treatment is capable of disinfecting water faster than chlorine without the use of retention tanks and harmful chemicals to your drinking water. The UV lamp emits powerful ultraviolet light and incorporates natural ultraviolet light energy to eradicate microbiological contamination. Water enters through the bottom part of the reactor chamber and swirls around a high output, low pressure mercury vapor lamp thermally protected by a quartz sleeve. Energy components contained in microorganisms absorb the light energy; this disrupts the DNA and prevents reproduction. Great to be used as stand-alone bacteria and biological pathogen removal system, as well as part of Whole House Systems for biologically unsafe water (private wells), and for commercial purposes such as pools, restaurants, spas, and any other locations where commercial water disinfection is desired. 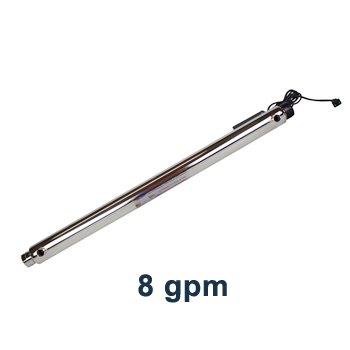 Our 6-12 GPM Ultraviolet Water Sterilizer Systems are manufactured with axial flow reactors in 304 stainless steel and comes with 1/2” to 1” MNPT connections. The hard glass germicidal lamps provide an economical way of treating water requiring a 99.99% reduction of microorganisms. This process is accomplished without adding any harmful chemicals to your drinking water. 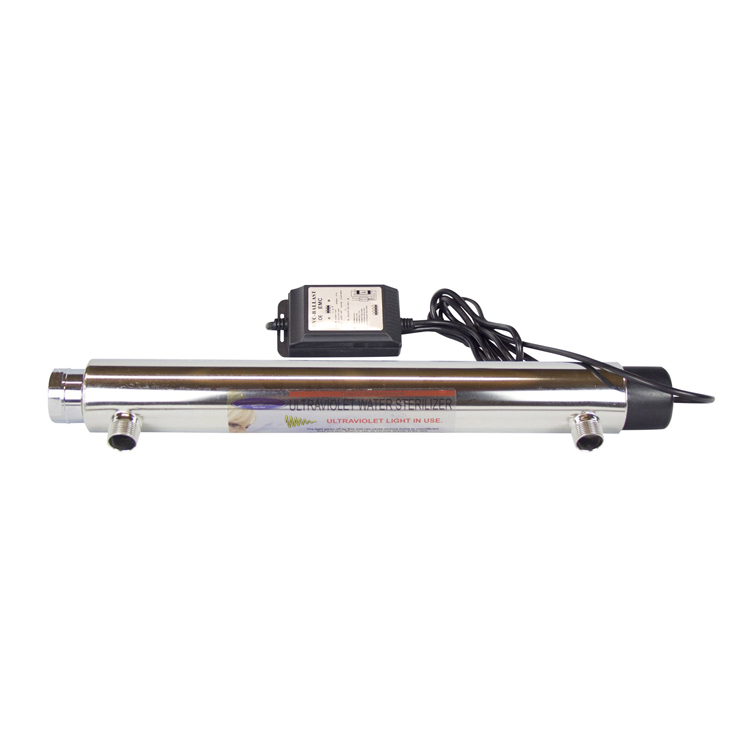 This UV Water Disinfection System is extremely cost efficient and the most ecological way of treating your water. 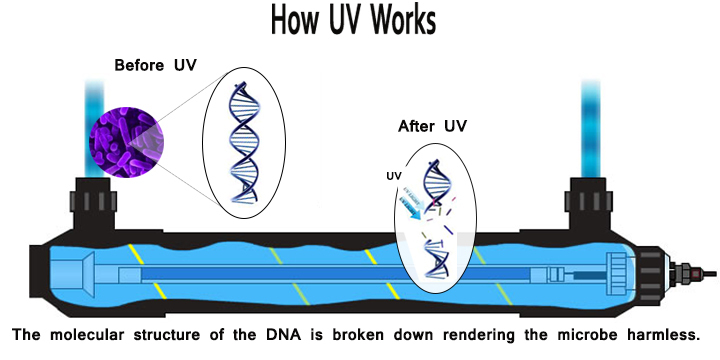 For the list of removed biological contaminants, visit UV light bulb page here. No chemicals added and no byproducts to the water supply(i.e. chlorine + organics = trihalomethanes). No handling of toxic chemicals, no need for specialized storage requirements. 6 GPM CQ-UV-6 CQE-UV-00102 1/2" MNPT 6.0 3"x21"
8 GPM CQ-UV-8 CQE-UV-00103 1/2" MNPT 8.0 3"x40"
12 GPM CQ-UV-12 CQE-UV-00104 1" MNPT 12.0 3"x40"
- Applications include post under sink water filters, post whole house water filters, water coolers, pre and post osmosis systems, private wells, camp grounds, hotels, bottlers, aquaculture, hospitals, food, cottages, restaurants, breweries, laboratories, marine, pharmaceutical, dairies and many other applications. - Units are manufactured standard with 110v electrical outlet but are also available in 220v if requested.